Hawaii's seasonally adjusted jobless rate fell to 3.1 percent in March, the last full month before the high-profile closures of Aloha Airlines and ATA Airlines, according to data released yesterday by the state Department of Labor and Industrial Relations. Still, Hawaii tied with North Dakota, Oklahoma and Wyoming for fourth-lowest unemployment rate in the nation. 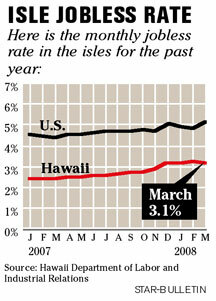 Hawaii's March rate remained well below the national average of 5.1 percent, which was up from 4.8 percent in February and 4.4 percent the year before. Michigan had the highest unemployment rate at 7.2 percent, while South Dakota posted the lowest jobless rate at 2.5 percent. The state's unemployment rate last month fell slightly from 3.2 percent in February, but was up from 2.5 percent in the year-earlier period. "If you look at the year-to-date number we have an excellent employment situation," said James Hardway, a spokesman for DLIR. "Given that and the fact that we have an ongoing skilled labor shortage hopefully those displaced (workers) ... can transition to employment very quickly." The state's seasonally-adjusted labor force last month totaled 658,000 -- 637,500 employed and 20,500 unemployed. The industries that saw job growth include trade, transportation and utilities, leisure and hospitality and other services, while the sectors posting job decreases were construction, educational and health services. "Clearly we're coming from a position of much greater economic strength and absorption for displaced workers than where Hawaii is now headed," said Paul Brewbaker, Bank of Hawaii's chief economist. Over the past six months, Hawaii's seasonally adjusted jobless rate has ranged from 2.8 percent to 3.2 percent, while the national rate has been between 4.7 percent to 5.1 percent.